The SpaceX mission combined the goals of two separate flights under NASA's Commercial Orbital Transportation Services Program, known as COTS. Originally slated to fly by the station and then come back to Earth, SpaceX and the NASA agreed to let the Dragon connect to the laboratory as long as a string of performance tests were successful. SpaceX launched the Dragon capsule on top of the company's Falcon 9 rocket at 3:44 a.m. EDT on May 22 to begin the chase of the space station. Working with an instantaneous launch window, the SpaceX launch team executed a flawless countdown that culminated with the Falcon lifting off from Space launch Complex-40 at Cape Canaveral Air Force Station in Florida. The Dragon began accomplishing a long list of operational "firsts" soon after reaching space, including the first use of the trunk, a small module attached to the bottom of the capsule. The trunk holds a pair of solar arrays that generate electricity for the Dragon capsule. On operational missions, the trunk can be loaded with cargo that can be exposed to the vacuum of space. Doors on the Dragon opened as-planned to reveal the navigation instruments and other hardware the spacecraft would need to pick out the International Space Station in the void of space and then fly to it. The first approach came on day three of the mission, when Dragon steered itself around the station remaining 1.5 miles clear. Numerous tests were run on the spacecraft and its communications with the crew on the station. 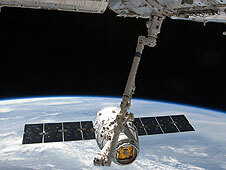 Astronaut Don Pettit guided the historic link-up the next day, Friday, May 25, when he reached the station's 32-foot-long robotic arm, Canadarm 2, out to the Dragon as it hovered near the station. "Looks like we caught a Dragon by the tail," the astronaut radioed from the station to ground controllers in Houston and at SpaceX's Hawthorne control center after the arm connected to a fitting on the side of Dragon. Pettit steered the capsule to the Earth-facing port on the Harmony module while fellow station crewmember Joe Acaba locked the hatches together. The crew unloaded the Dragon's cargo over the weekend and placed used equipment back inside for the return to Earth. The Dragon is the only cargo-carrying spacecraft designed to return safely to the planet rather than burn up in the atmosphere. "We all remember the transcontinental railroad that opened the Western frontier," Pettit told reporters. "It was celebrated and completed by a golden spike. This is kind of the equivalent. No one remembers who pounded it in, but its completion was important and remembered." Musk said the ambitious mission should ease concerns people had about the rocket, spacecraft and future plans. "There was reason to doubt that we would succeed because there wasn’t a precedent for what we achieved," Musk said. "I think those reasons no longer remain having done what we have done so I hope those doubts are put to rest." On Jan. 22, NASA took a crucial next step toward launching astronauts to the International Space Station from the United States. Beginning the first phase of the Commercial Crew Program's (CCP) certification efforts, three companies now are conducting activities that will confirm commercial spacecraft are safe to carry crews to the station. This landmark comes as the agency celebrates the 45th anniversary of an essential stage in sending Americans to the moon. Launched Jan. 22, 1968, Apollo 5 was the first unpiloted flight of an Apollo lunar module successfully flown from Cape Canaveral Air Force Station, establishing the module's ability to perform as designed. 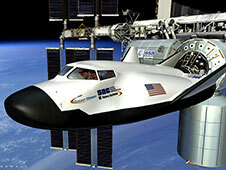 The mission also helped certify that the spacecraft could safely fly with astronauts on its next mission. Similarly, through May 30, 2014, three companies are working under contract with CCP to develop products to implement the agency's flight safety and performance standards and requirements. The Certification Products Contracts (CPC) will establish standards across all aspects of commercial crew systems, including design of the spacecraft, launch vehicles, and ground and mission operations. As the first human spaceflight development program based at NASA's Kennedy Space Center, CCP will provide the U.S. its own transportation capabilities to the International Space Station. "Throughout the phases of this program, we've really been creating a capability for the nation to use for low-Earth orbit transportation," said Ed Mango, CCP manager at Kennedy. "As we create that capability, then NASA will become a customer so that we can move our flight crew to the International Space Station and continue our critical science." The CPC contractors are The Boeing Company of Houston developing the CST-100 spacecraft that will launch atop a United Launch Alliance (ULA) Atlas V rocket; Sierra Nevada Corp. Space System of Louisville, Colo., building the Dream Chaser also set to launch on an Atlas V; and Space Exploration Technologies Corp. (SpaceX) of Hawthorne, Calif., maturing its Dragon capsule and Falcon 9 rocket for crewed missions. Under the contract's certification plan, resulting data will aid in developing engineering standards, as well as needed tests and analyses of crew transportation system designs. The second phase of certification efforts, expected to begin in mid-2014, will involve a full and open competition. It will include the final development, testing and verification processes necessary to allow piloted demonstration flights to the space station. NASA is facilitating the development of U.S. commercial crew space transportation capabilities with the goal of achieving safe, reliable and cost-effective access to and from low-Earth orbit for potential government and commercial customers. Like the goals of CPC, a key objective of Apollo 5 was to ensure the vehicle would fly safely. Mission objectives included verifying that both the lunar module’s ascent and descent engines would ignite as planned and evaluating the strength of the spacecraft’s overall structure. The engine that would be used to land on the moon was fired several times. Then, the ascent engine was ignited successfully simulating an abort during the landing phase. This involved the ascent propulsion system being started simultaneously with the descent engine being shut down. At the time, Maj. Gen. Samuel Philips, director of the Apollo Program Office, said that the lunar module's maiden flight completed testing of the last major piece of Apollo flight hardware. All other Apollo hardware elements had been tested throughout the previous two years. Between late 1968 and the end of 1972, 11 piloted Apollo missions were flown, nine going to the moon, six of which landed on the lunar surface. Running concurrently with CPC is the agency's CCiCap initiative, short for Commercial Crew Integrated Capability. During CCiCap, SpaceX is planning for a pad abort test and in-flight abort test, SNC will begin its flight test phase, and Boeing, working with its subcontractor ULA, will check the compatibility between their spacecraft and launch vehicle. All of these milestones could be used by NASA in the future to validate the commercial systems are safe for crews, much like the Apollo 5 mission did 45 years ago. While NASA works with U.S. industry partners to develop commercial crew capabilities to transport American astronauts to the space station in low-Earth orbit, work also is ongoing for NASA's first spacecraft to travel beyond the moon.